If you have a notebook computer without an optical drive and want to install Windows onto it, you have a challenge. But it is not impossible and with the right tools, it is doable. This can save you the cost of buying an external optical drive for your Netbook. But is it a cost effective solution? There are a number of use case scenarios where you would need to install Windows onto a computer without an optical drive. Maybe your Netbook came with Windows XP and you want 7 on it or vice versa. 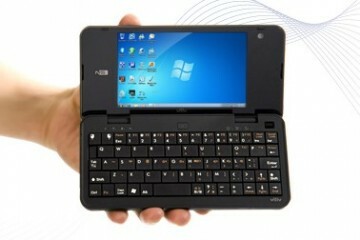 Could be that you have one of those Linux Netbooks and want to go with Windows. Or maybe you are like me and bought a computer that has Windows 7 Starter Edition and want to upgrade to Home Premium or some other version. This tutorial will show you how to install Windows without a CD drive. The simplest way to install a new OS is to buy an external optical drive, plug it in, and after inserting the Windows installation disc into the drive, boot the computer from that drive. Maybe you’re like me too cheap to drop $50-$150 on an external drive. It could be that you are not too cheap, but are too broke. So how do you install a new OS without an external or internal drive? The first thing you will want to do is make sure you get everything you want off the computer. Either connect to a network or plug in a USB drive and copy everything want to keep. Don’t use the same USB drive you plan to install Windows with. If you don’t know where something is stored in order to back it up, then do a Google search, go to your software’s web site or look in the Help. You could also just ask in the comments below and maybe we or our readers can help. A final step is to make sure you deactivate certain software. I always forget this step. Programs like iTunes or Adobe Photoshop have activation. You can deactivate it in the program. Then after you install it later you can reactivate it. In order to install Windows on your computer you will be using a USB drive, like a Flash drive or external hard disk drive. We will assume you are using a flash drive. Make sure that it has at least 4 GB on it. You will also want to start with it empty. So take off whatever might be on it that you want to save. There is the long way to do this or the short way. The long way requires preparing the USB flash drive and making it bootable. Then you copy your install disc contents. It is very complicated. You would have to go into the Command Prompt and use a utility called DISPART and BOOSECT. If you want to follow that method, then follow the steps laid out here. A much easier method of preparing the USB flash drive is to use the Microsoft Windows USB/DVD Download Tool. If you go with this route, then the easiest thing is to actually use your Notebook to download Windows itself in ISO format from Microsoft. 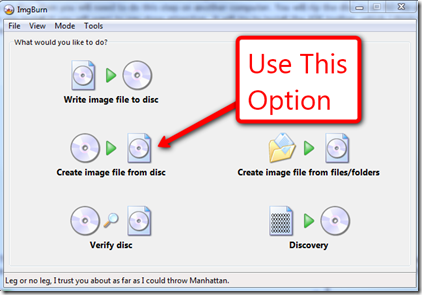 An ISO file is a copy of the disk in one single file. 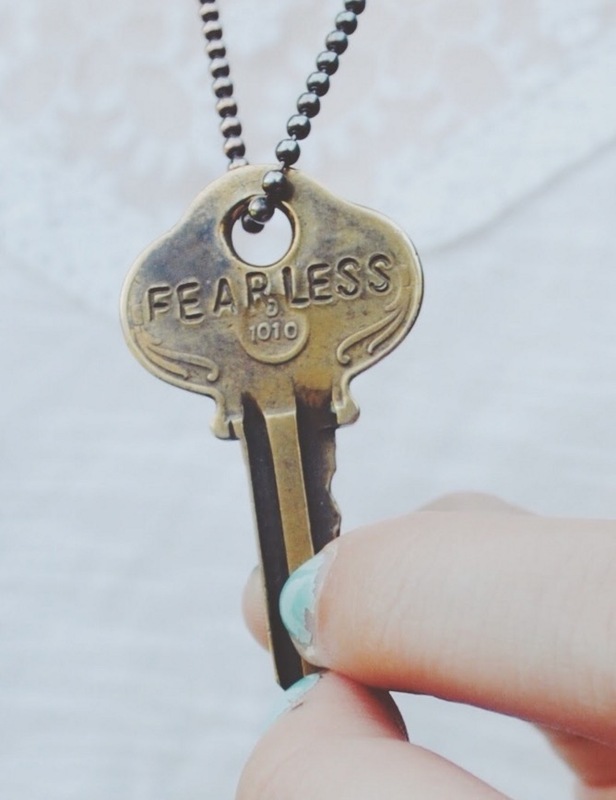 It might be the easiest, but it is not the cheapest. 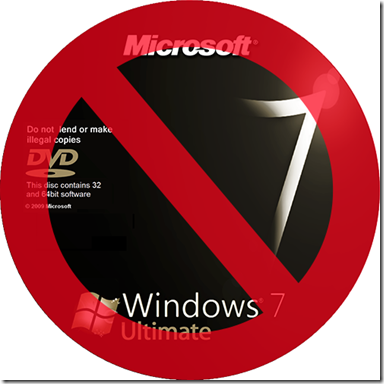 Windows 7 Home Premium upgrade from MS is $119 while an OEM disk of the full version can be found online for under $100. As I said before, I am cheap. If you buy a copy on disc, then you will need to do this step on another computer. 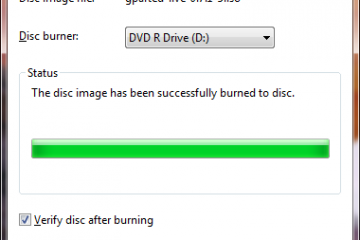 You will rip the disc to an ISO file using a program like ImgBurn. 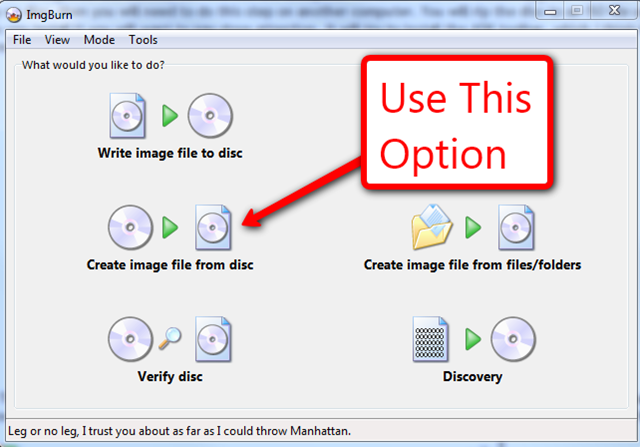 It is a free program used to either burn or rip DVD image files and it works with ISO files. When you install it you will want to pay close attention. It will try to install the ASK toolbar, which I think is useless. After installing it, fire it up and tell it to copy the contents of the disc to a location on your hard drive in ISO format. It is a very simple program. 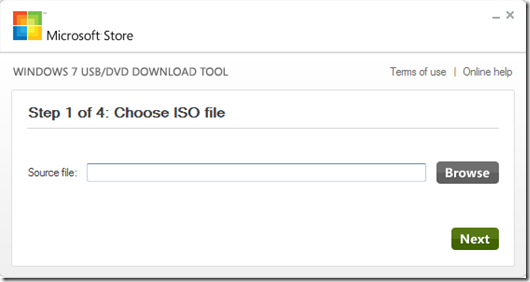 Now that you have your ISO file, start up the MS USB/DVD Download Tool. The name makes it sound like you are downloading with this tool. But instead it is intended to be used to create an installation disc from a downloaded ISO file. 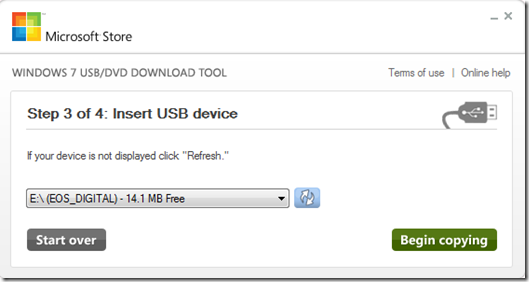 It will prepare the USB flash drive using your ISO file created in the previous step. 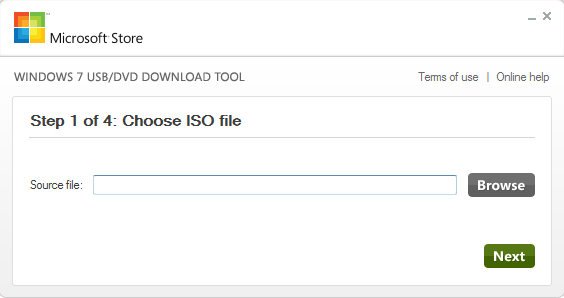 When you run the Download Tool it asks you to point it to the ISO file. Point it to the file that you ripped using ImgBurn. Browse to the file’s location and double click it. Click Next and choose USB device. The next step will ask you which drive is your USB device. Select it from the drop down box and hit Begin Copying. It will setup the installation files on your USB drive for you. When the program completes you will have a Flash drive that can now be used to boot the computer and install Windows. 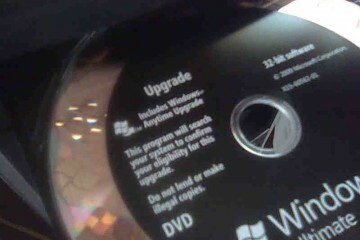 If you choose to buy a downloaded copy of Windows from Microsoft’s store, then you simple skip the part of this step that requires ripping from the DVD. Just open the MS tool and follow the instructions above. At this point you are almost ready to start the installation of Windows. Your computer might work just fine after you install Windows. 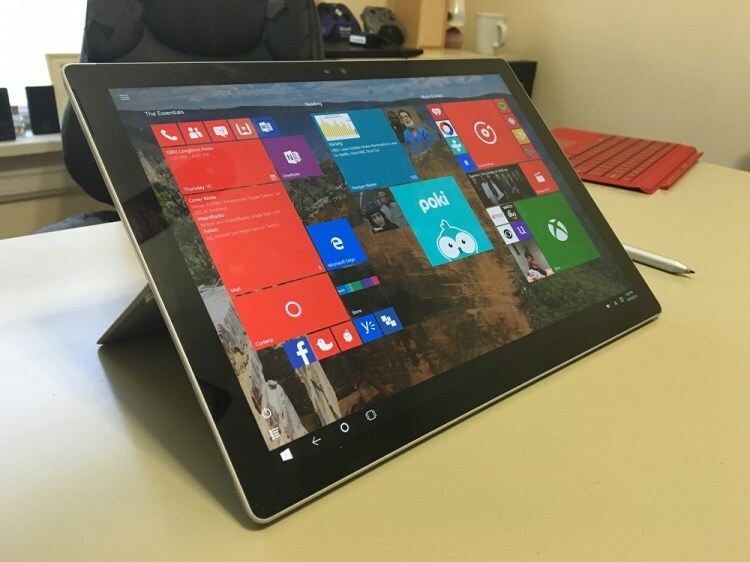 But chances are it has some hardware that requires proprietary drivers from the manufacturer. To be save, you will want to download all of these from the manufacturer’s support site. If you don’t know the web address, search Google for it. When you get there look for a link to Support or Drivers or Downloads. For example, I used these steps to install on a new Acer Netbook I bought for my son. On the Acer site there is a link called Service & Support at the top of the page. From there I followed the link to Driver Downloads. Just look around for it on your manufacturer’s site. Download all the driver files and any special software you know you will want that is available. You may also want to check to see if there is a BIOS update. If there is, make sure it doesn’t say in the update notes that this version is required to be compatible with the version of Windows you are installing. If it does, very carefully follow the instructions for how to install it before you try to put the new version of Windows on your computer. After all the files are downloaded, see if you can extract any of them. Some manufacturers have their drivers in an archive file that is an executable. Others use a Zip file. You can test this by using a program like 7-Zip to try an extract the files. This will make installing them later much easier. If your USB Flash drive has enough room, go ahead and put all the drivers in a new folder on the drive called something like Drivers. Otherwise put them on another Flash drive. If you downloaded special software that came with the computer put that on the Flash drive too. Here is where there is one problem. Some of these programs are not available for download on the manufacturer’s web site. There are a few of these on my Acer Netbook. If that is the case you will have to somehow get them from the computer. This is explained below. Here is the problem with some of the software on your PC. The manufacturer does not put all of the software it loads on your PC on their web site. Most of the time this is no big deal because a lot of this is junk. They load it on there because companies like McAfee or Norton pay them to. Often the programs will be Trialware and will require you to pay for them after a short period of time. But some of the software is actually useful. On our new Acer we wanted to be able to use the WebCam software and my son liked the preinstalled games. 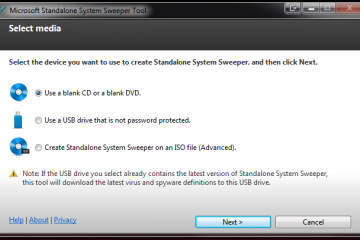 If your computer came with an installation disc, it may be as easy as copying it over to the flash drive using another computer. But few PCs come with discs. Instead they are come with a utility that you use to create the disc. Sadly, the geniuses at the manufacturers are either not thinking about the fact that they sold you PC without a disc burner or they know that want you to have to pony up some extra cash for an external drive, hopefully from them. Again, I’m cheap. So here is a way around this. You can just get the content off the computer, but it might require some complicated technical maneuvers. It is likely that your computer has a small partition that contains the recovery software. The utility that makes the discs uses this partition as its source. There may also be a way to boot into this recovery partition and run the recovery without using discs. If that is the case, cross your fingers and hope that the partition is not hidden. Most likely it is. If not, just go into Windows Explorer and copy the files off of it. But if it is hidden like most you will have to unhide it. On our Acer, the partition is hidden. To back up the recovery partition yourself, you will have to go into the Command Prompt and enter commands to unhide it. Realize that just because you unhide the partition, the files may not be in a format you can easily use. Many of them will be in WIM files (a WIM file is a special format used by Microsoft and partners to deploy Windows 7; you will need to extract them using a program called ImageX that comes with the Windows 7 installation disk or with a program like 7-Zip archiving software). To check and see what is on this partition; unhide it using the following steps. If you are not sure if you have a recovery partition, open the disk management part of computer management. Right click My Computer or just Computer on the desktop or in the Start Menu of Windows. Select Manage. In that window choose Disk Management from the left. You will see your list of disks. If you have only one hard drive in the computer then it will be listed as at the bottom. If there are two partitions with one having a drive letter (most likely C:) and the other doesn’t have a drive letter, then you have a hidden recovery partition. If the second does have a letter, then you are in luck. If that is the case, simply open Windows Explorer and backup the files to an external USB drive. To unhide the recovery partition, if it is hidden, open a command prompt by clicking Start, Run and type CMD. In the command prompt type DISKPART. (These don’t have to be capital letters, but I will show it in capital letters so you will know what to type.) The regular prompt will be replaced by one that says DISKPART>. Now type SELECT DISK=0 if the recovery partition is on the first drive. 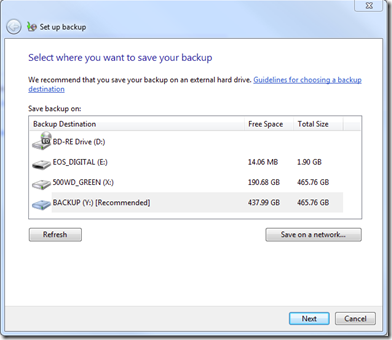 If you have more than one drive select the drive on which the recovery partition is located. The first disk is 0, the second is 1 and so on. Now type DETAIL DISK. 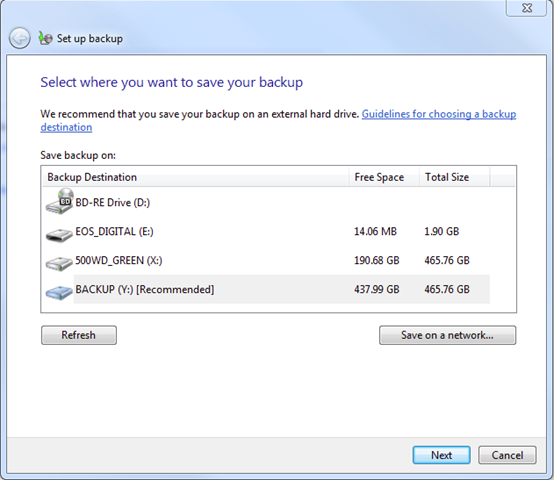 Find the partition for your OS and the one for your recovery partition. We will now select the partition with the OS installed. Type SELECT PARTITION=1 (choose 2 if the OS is on 2). Now type DETAIL PARTITION. Make note of one of the parameters in the results. It is the Type parameter and will likely be 07. Remember this. Now do the same for the recovery partition by typing SELECT PARTITION 2 (choose 1 if the recovery partition is on 1 instead) and then DETAIL PARTITION. The Type for this will be different likely 27. We are ready to unhide the partition. The command to do that is SET ID=07 OVERRIDE. If your OS partition had a value other than 07 then replace the 07 in this command with that value. Most of the time it will be 07. You should see a message that it changed the type. Now you are ready to simply back up the contents of the recovery partition. Copy them to an external USB drive or to a network location. If they are all in WIM format, then after backing them up you will want to extract them using 7-Zip. Search for the programs that you need and copy their installation files over to your USB flash drive that you will use to install Windows. Sadly, you may not be able to find them all. If that is case, you have a decision to make. Is this program so important that I cannot live without it? If so, you will have to abort this process. You may be able to find a good alternative. Search the Internet and see if a paid version is available for a cost you don’t mind paying; or most likely you can find a similar free version. To be honest, very few of these OEM installed programs are worth aborting this process. If you need help finding an alternative, leave a comment below and I will try to answer it. If you may also have programs on CD or DVD that you want to install to the computer, then you could put them on the USB drive also in their own folder. But it may be best to wait till after you have Windows, drivers, and updates installed. This is especially true if your USB drive is not large enough. So, we will do this later. If you do copy the installation programs from CD or DVD, you will need to use another system that has an optical drive. It is now time to install Windows. 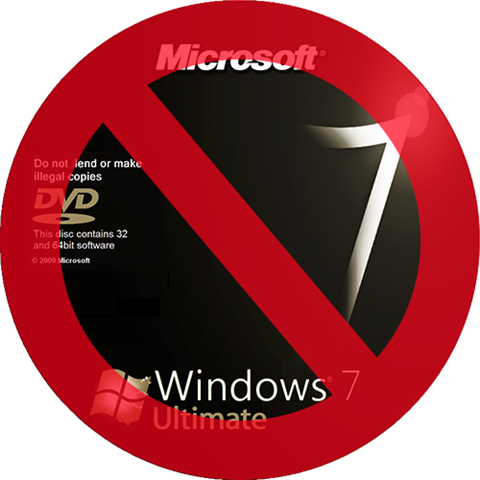 This guide covers installing Windows 7, but Vista will be similar. XP might look and behave much differently. Shut down the computer and insert your USB disk into the port. Boot up looking for the keystroke required to either enter setup or the boot menu. Most systems today have a boot menu with a list of bootable devices. On my Acer the key is the F12 key. This will likely be displayed when you boot up. If it is not, then you may have to enter the BIOS setup screen instead. On my Acer this was the F2 key. If you don’t know yours and it is not displayed on startup, look it up in the documentation that came with the computer, on your manufacturer’s web site, or do a Google search for the BIOS maker’s key combination. The BIOS maker should be displayed on boot up. Here is one helpful place to start looking for the right BIOS key commands. Set the USB device as the primary boot device in the BIOS setup or choose the USB device from the Boot Menu. This will lead you to the Windows installation. Follow the instructions using the Advanced option. 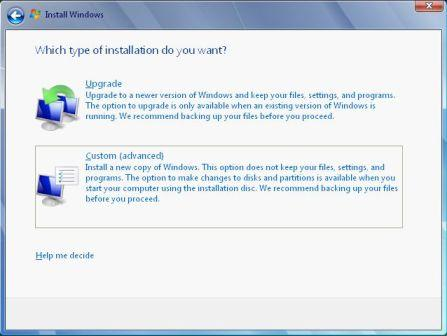 This displays the Windows installation partition options. You now have a choice. You can just use the partition that now has the old OS on it or you can use the entire disk. If you use the entire disk, then delete all the partitions (likely 3 of them) including the recovery partition. At first I always choose to just delete the Windows partition and leave the recovery partition in case something goes very wrong. 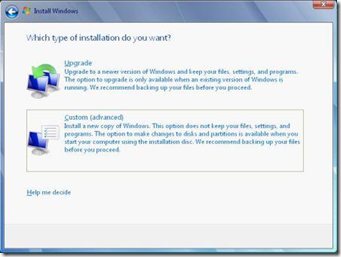 After deleting partitions, then choose the unpartitioned space and choose to install Windows there. This will take awhile depending on the system speed. The computer will reboot at least once or twice. Just be patient till it finally finishes. Once Windows is finished installing and boots for the first time, enter your user name and password information. Also enter your license key, although you can skip this for now if you wish; you can run Windows 7 for awhile before you have to enter the key. Choose the options for the next few screens based on your preferences. I suggest Use recommended settings, Automatically adjust clock for Daylight Savings Time checked, and then enter your network password if you are trying to connect to a password protected Wi-Fi network. 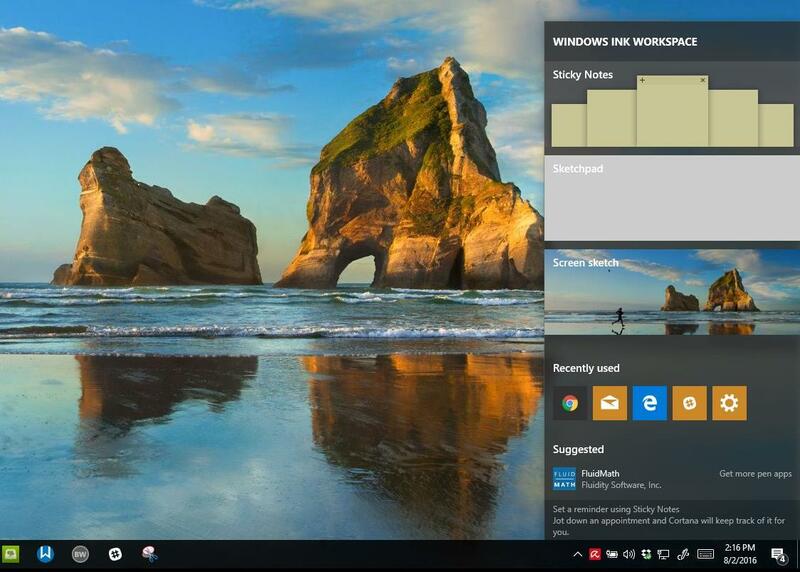 Windows will prepare the desktop for the first boot. After it is finished, you are ready to make sure all the drivers are installed. Click on the Start menu and right click Computer. Choose Manage and then Device Manager. If Windows does not find any device drivers there will be a yellow exclamation mark next to the item. On my Acer there were none, but that is unusual. At this point, find the drivers folder you put on the USB key or disk. The very first thing you should install, even if there were no exclamation points, is the chipset drivers for your computer. Second are the display drivers. After those two, it is really up to you what order you choose to install them next. First, I install any network drivers needed. Then I get my pointing device and sound working next. The last thing I install are peripherals that are least used like cameras, TV tuners, or special button drivers. If after installing all drivers from the web site you still have an exclamation point showing in Device Manager, you will have to do some investigative work. One way to do this is right click the item and choose Properties. Look in there for distinguishing information like numbers or manufacturer names. Search for them on the web along with your computer manufacturer make and model. You will likely find out what they are and where to get drivers for your version of Windows. Next get all the Windows Updates. Click the Start menu and type Update. You will see Check for Updates from the Control Panel. Click it and it will begin to search for Windows Updates. You should get all the important ones. Also check on the optional updates to see if any are needed, like driver updates. You may have to run this a few times rebooting between each instance to get all the updates. The last thing you will need to install is your software such as antivirus, anti spyware, office suite, music software, video software, etc. It is best if you can get these as downloadable installation files. But as we said before, you may have to borrow a computer with an optical drive and copy the install files to a USB drive. I suggest that if you have enough room, use the same USB drive you used to install Windows and your Drivers. Make a new folder called User Software or something like it. Then, in that folder, create new folders for each program you wish to install, like Office, Burning, Video, etc. Put the installation files in those folders. If they require serial numbers or keys, make a text file with the serial number as the name (for example XXX888.txt) so that all you have to do is right click on the file name, choose Rename, highlight the name and copy it, then past it into the box in the installation software. After you have all your software on the USB disk, plug it into the notebook. Make sure you start by installing your Antivirus software. If you do not have any get a free one like Microsoft Security Essentials or AVG Antivirus. Anti malware software like Malwarebytes is next. Then go with others in whatever order you choose. Reboot after each if necessary. At this point, you should be finished. The real question is, after all of this, is it really better to go through this trouble than to just buy a cheap USB DVD Burner? I saved some money, but it took me awhile to get it done. Hopefully, with this guide, you won’t have to search for solutions like I did. If you have any trouble following this guide, post comments/questions below. If you know of better tools, then also post them below and we may update this guide.